Extreme Sudoku is exactly what you expect from a sudoku game. A way to test your brain and have fun. No animations, no distractions, no background music, no sound effects. Just great Sudoku compositions! 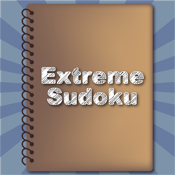 Extreme Sudoku has 12 levels with millions of games to keep you entertained for centuries.